...in the tech/digital world. Lord knows, and anyone who reads this blog, that my favorite things are most definitely my kiddos! BUT! Lucky you, today I'm going to give you a little insight into my favorite techie things, most importantly, my pictures--and how I keep them safe in case my paranoia comes true and they magically all delete themselves from my social media channels one day. GAHHHH! Wouldn't that be awful?! Yes, yes it would. Instagram is my go-to photo sharing app. I have well over 7600 pictures linked to my account, and I most definitely want ALL of them. I am pretty good?? about backing up my phone pictures to my computer, but, if I'm being honest, my go-to in finding an old pic is looking on Instagram--cause I know I posted it there. Anyways, so I wanted to backup all of my current Instagram pics. 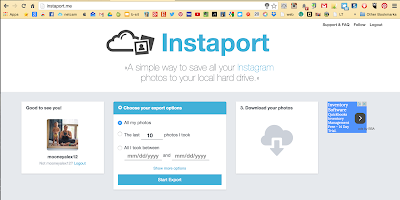 I found this website (instaport.me) that is AWESOME and FREE and will export all of my photos into a .zip folder where I can then download them. Woo hoo! So I did this and actually let it run overnight, since I had a lot of pics to export. Once that exporting was done and I unzipped the folder, I had all 7600+ of my Instagram images in one place. YAY! I dated this export folder and moved it to my external hard drive. I also uploaded this folder to my Dropbox account so I'd have access to it remotely if need be (I'm nuts and always like to backup my stuff in two different places...just in case :). So, that was easy enough to export my current Instagram pics, but I didn't want to keep having to do this (or shoot, remembering to do it!) all the time. Instead, I turned to IFTTT, which is short for If this then that. Basically it's a (FREE!) service where you set up recipes based on triggers on websites, social media channels, and much more. 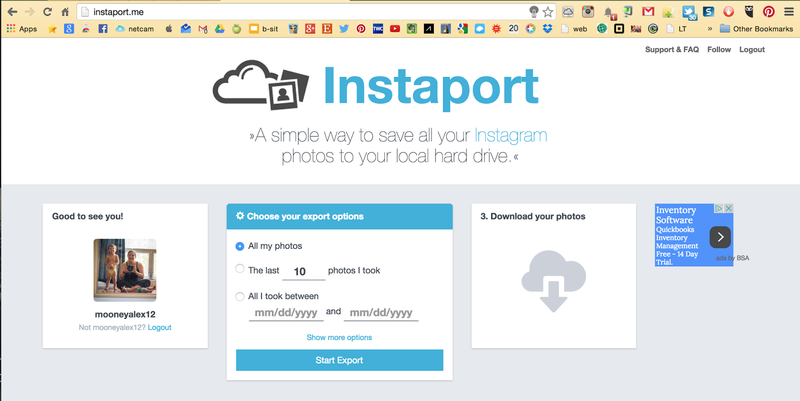 An example of this is how I'm backing up all of my Instagram photos from after I did the instaport.me download. I created a recipe that says if I post a new photo on my personal Instagram account, it then adds that file to an Instagram backup folder in my Dropbox account. How awesome is that?! I don't have to remember to backup my pics--it does it for me, and does it instantly after I post a pic (or video) on Instagram. Anyone like making movies? My favorite online video creator/editor is WeVideo, and it's basically like iMovie but FREE (well, I have the paid version through school and it's got a few more features, but not much more than the free one!) and you can use it on your phone, tablet, or computer! The awesome thing is that you can share your movies with others to have them simultaneously work on them as well. It's pretty awesome. So that's about all I've got for my favorite techie things online. I'm sure this list will grow and change, as technology always seems to do faster than anyone can keep up. But hey, at least I blogged it for now to maybe enlighten a few people onto these awesome online tools?! Here's hoping. Thumb Sucking and Other Fine Things.